Ratha Saptami is one of the most awaited days representing a symbolic change of season from winter to spring and start of harvesting season which is celebrated as Lord Surya’s birthday. The Ratha Saptami festival seeks the benevolent cosmic spread of energy and light from the Sun God and is symbolically represented Sun turning his Ratha (Chariot) drawn by seven horses (representing seven colours or rainbow) towards the northern hemisphere, in a north-easterly direction. The seven horses represent the seven days of the week starting with Sunday, the day of the Sun God Surya. The Chariot has 12 wheels, which represent the 12 signs (each of 30 Degrees) of the Zodiac (360 Degrees) and constituting a full year, named samvatsara. The Sun’s own house is Leo (Simha) and he moves from one house to the next every month and the total cycle takes 365 days to complete. Why perform 108 Suryanamaskar on Ratha Saptami Day? In Yoga, an exercise named after Suryanamaskar / Sun salutation – a series of 12 postures/ exercise for physical, emotional, spiritual and meditational benefits. 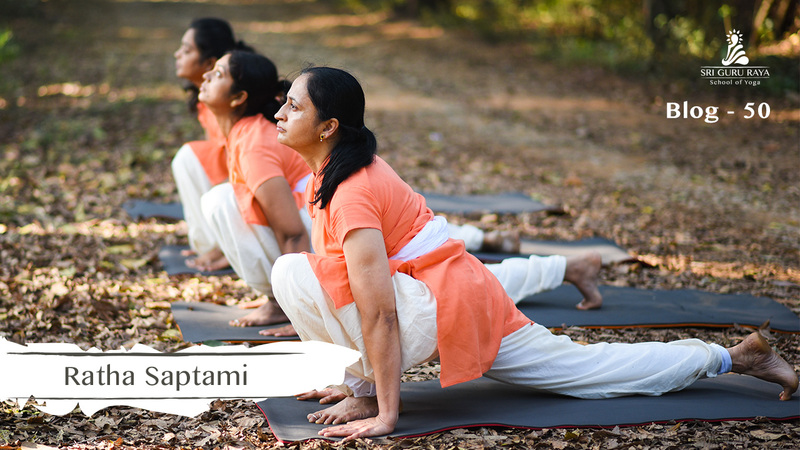 On this auspicious day, individuals assemble before sunrise and perform the Suryanamaskar to experience the rejuvenating first rays of Sun on the body. On this day, 108 Suryanamaskar is performed as the earth takes 108 steps around the Sun and the distance between the planets and the Sun is 108 times the diameter of Sun. And the diameter of the Sun is 108 times more than the diameter of earth. Hence, 108 Suryanamaskar is performed on this day. In view of the above, our “Sri Gururaya School of Yoga” is organizing a session of Suryanamaskar / Sun Salutation by performing 108 Suryanamaskar on 12th February 2019 at the “Smt. Boramma and Sri Narasimhaiah Party Hall”. Please assemble by 4:45 AM and the session will start sharp by 5:00 AM. Venue: Smt Boramma And Sri Narasimhaiah Party Hall, Chandana layout, Sunkadakatte, Bengaluru, Karnataka 560091.